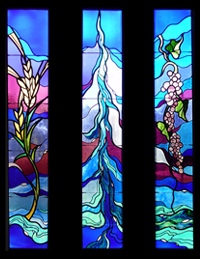 Modern impressionistic windows are usually characterized by fine mouth-blown cathedral glass and have very little paint, if any. Instead of painting the fine details such as robe folds or wood grain, glass is carefully chosen for it’s character to replicate these details. 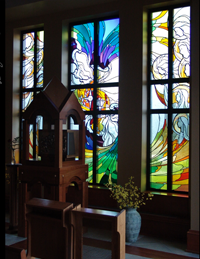 Additionally, the use of mouth-blown cathedral glass over opalescent glass lends itself to more vibrant and striking colors. Where opals are more opaque and provide denser colors, mouth-blown glass is more translucent, allowing more sunlight to filter through and thus brighter windows. Impressionistic windows in general are usually more focused on symbols, shapes, and color as opposed to scenes with human figures. 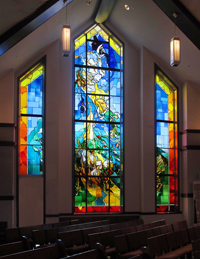 Modern Impressionistic windows use more abstract designs to convey Christ’s message through color and symbolism.